If you have thick hair, you probably run the same blow-drying marathon as I do. Holding your hair dryer up when drying thick hair seems like an eternity and represents death for your arms and ears. And this is how you realize that not every hair dryer is built quality and offers the same high efficiency when it comes to drying a thick hair. There are weak hair dryers that will fry instead of dry your hair. And there are the lightweight quiet but still powerful dryers that keep your hair healthy and smooth. What wattage best hair dryers have? Should the hairdryer I buy be lightweight or heavy? Besides wattage and weight, what else should I focus on? How to blow and style my thick hair like a professional? How to apply hair products? And those dryers should be the only dryers you need to pay attention to and chose from. Why? Well, because no one wants to stand in the bathroom for over 30 minutes and dry their thick hair while thinking “I’m late again.” I bet you don’t want this too. That’s why I made a list of the most effective hair dryers for thick hair which you can choose from. They offer an effective quick way to dry thick hair and minimize the damage. If you want to save time on drying your thick hair, T3 Digital IonAir hair dryer is the perfect choice for you. It has a digitally controlled broad volume of air increased with negative ions in order to dry your frizz and give it a healthy-looking, silky hairstyle. It’s one of the best hair dryer for thick hair that you can use on daily basis. The styling and concentrator attachments make it easier to dry in record time and style precisely. It leaves the hair softer, smoother and a lot stronger instead of causing damage like low-quality hair dryers that will fry instead of dry your hair. The built-in generator will leave your hair shiny and give you the best results. The dryer has 3 heat and 2-speed settings. And it comes with a 2-year warranty. What more could you possibly ask for? If you want to prevent your thick hair from getting damaged while drying, go with the Dyson Supersonic hair dryer. It will help you preserve the natural shine of your hair. It’s designed for fast drying and you will get it with three magnetic attachments such as diffuser, styling concentrator and nozzle. Lightweight and balanced, this dryer will become your favorite styling tool. It’s even acoustically tuned and cold at touch. Thanks to the heat shield technology, the surface of this hair dryer remain cold. That’s a plus because most dryers turn hot after a longer usage. And you know how long does a thick hair need to dry. Dyson Supersonic has 4 heat and 3-speed settings. It has the fastest digital 27mm V9 motor that spins very fast and will dry your hair in no time. If you have a damaged hair that needs to be repaired, the NITION ceramic dryer will help you do it. The ceramic covered air vent is filled with Nano Silver, Tourmaline and Argan oil that will help your hair gain the healthy, shiny and smooth appearance. If you wonder how the mentioned elements benefit your hair, allow me to explain in short. The Nano Silver is often used in healthcare, cosmetics, medical treatment, and textiles, while the Argan oil represents a well-known product for hair moisture restoration and getting that silky touch. It also prevents your hair ends from blooming and makes your hair resistant to ultraviolet light, while the tourmaline releases negative ions that will reduce the creation of static electricity and prevent your hair from getting damaged. The hairdryer has 2 airspeed settings and 3 heating settings. It comes with a cool shot switchable (cool/warm) button for final touch after styling. The strong 1875 watt motor enables powerful airflow and dries your hair in record time without damage. If you want a hairdryer that’s efficient, powerful and quiet, go with the 1875W Professional Salon hair dryer. It has a lasting AC motor that helps you dry your hair in record time and cuts out the annoying noise other dryers produce. It will protect your hair and maintain it beautifully with a help of the negative ion and far infrared function. It has 3 heat and 2-speed settings that will help you style your hair with ease. The dyer weights only 1,2 pounds, meaning it’s lightweight and will help you reduce frizz. It has a removable end cap that allows you to clean the filter and keep the motor strong. If you’re looking for the perfect dryer for thick hair, this is it. Kipozi 1875 dryer represents an advanced device using Nano Ionic technology. So, if you’re looking for a dryer for your thick hair that will leave it flawless and easy on touch, this is the perfect one for you. It’s quiet, lightweight, and dries in no time thanks to the 1875W professional motor. It also has 3 heat and 2-speed settings, but also a cool shot button that will help you lock your hairstyle after drying and styling. It comes with attachments such as concentrator that’s ideal for precise styling, ALCI safety plug which is a big plus because it ensures the safety if there’s any leakage, and a diffuser that will help you get the perfect wavy hair and natural curls. It’s perfect for daily usage and will definitely help you reduce frizz and put your hair in place. VAV hair dryer uses negative ions to help you reduce frizz, while the ceramic covered grill releases infrared fast heat that will dry your hair in a blink of an eye. The dryer is lightweight with a 1875W DC motor, meaning it’s very powerful. It comes with two speed and three heat settings that will help you style your hair with ease and a cool button to lock your hairstyle when you’re done drying and styling. It comes with a 2-year warranty in a suitable size for home using. It’s comfortable in hand and you will be able to use it with ease. Know that when you press “low” it’s like you’ve pressed “cool”. And when you use the “cool” function, you need to keep pressing during the process. An extraordinary mix of speed, power, and design is how BaBylissPro can be described. If you’re into hair dryers that provide all these features thanks to the Nano Titanium technology and the 2000 watts performance, this is the product for you. BaBylissPro has 6 heat and speeds precise settings. It comes with a removable filter that allows easy cleaning. This dryer allows you to play with your hair like no other dryer because it offers different styles you can choose from. Its lightweight ergonomic handling keeps it on top of the professional styling tools list. Thick hair girls, what are you waiting for? RUSK represents one of the best lightweight ergonomically designed tourmaline and ceramic hair dryer. It’s extremely powerful and allows your hair to dry from the inside out thanks to the far-infrared rays that enter the outer cuticle of your hair. Although it’s strong, RUSK weights only 1 pound. It’s practical and easy to hold. You can hold it all day without feeling pain and numbness in your hand. It will meet all your expectations and styling needs because you’re buying one of the premier salon worldwide brands. If you have thick hair of any length that needs to be styled and improved in texture, this dryer is ideal for you. After washing your hair, dry it with a towel in order to squeeze all the water and part into sections. Take a styling brush in one hand, and RUSK dryer in the other and start your journey. To create extra volume, bend your head upside down. If you want maximum lift, position the airflow against the roots. It’s best to use styling brush, a large round brush or paddle brush if you want to get the best results. 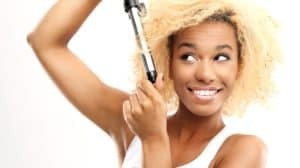 If you want to achieve the perfect salon look on thick hair, you’re looking at a very hard task if you don’t have the proper hair dryer in hand. 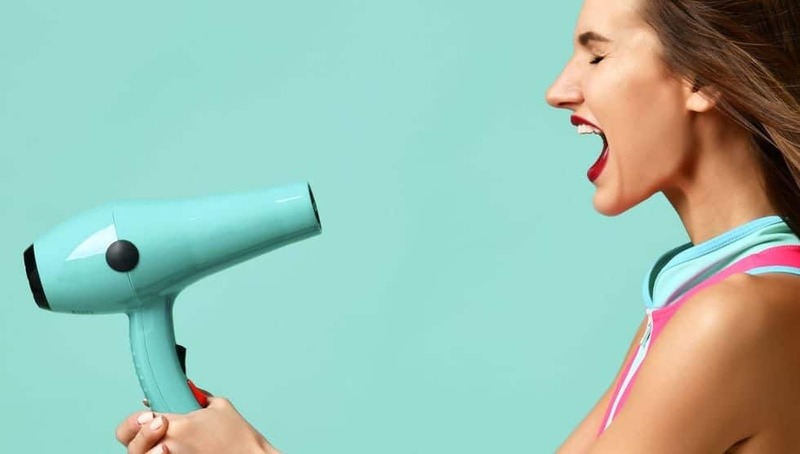 And why going to the salon when you can buy a professional hair dryer from the ones we mentioned above, apply some of these tips and do your hair every day? Going to the salon every day is more expensive than buying a professional hair dryer. And there’s nothing hard about doing your hair at home. You just have to pay attention to these features in hair dryers and pick the best one to dry and style your hair in no time. Although I’ve mentioned the best blow dryer for thick hair above, I want to highlight the features of the best hair dryers for you. If you have thick hair, you already know it takes an eternity to dry. And one of the main features a good dryer must have is a quality motor. Meaning, a high wattage that indicates the power of the airflow. The stronger it is, the faster it dies. Additionally, if you choose a dryer with a high wattage, it means you can use it at a lower temperature and still dry your hair in record time. However, if you’re in a super rush, you can always use full heat. But know it’s not recommended because it causes damage to your hair. Definitely LIGHTWEIGHT. Why? Well, if it’s heavy, it doesn’t mean it has a better motor and improved functionality. On the contrary, quality hair dryers are easy and comfortable in the hand. Meaning, you should definitely invest your money in buying a lightweight dryer. Although travel-sized dryers don’t have the highest wattage for drying your thick hair, you can still find lightweight versions of strong hair dryers. Diffuser and concentrator attachments are definitely featured you should pay extra attention to. They’re crucial for a fabulous and fast blowout on thicker hair. Both are made to minimize the damage and prevent frizz. For example, a concentrator nozzle helps you get that silky straight hair, while a diffuser is perfect for thick wavy hair. First and foremost, don’t even think about brushing your hair before it’s dry. You can start brushing and styling with your dryer when it’s about 85% dry. Start styling your hair on medium and use the hotter setting to complete the look. Once you’re done with all of this, press the cool button to lock in your hairstyle. While drying your hair, don’t just hold the dryer in one place because that’s wrong. Instead, follow the brush with the nozzle faced in the direction of the brush in order to style your hair like a PRO. When drying a thick hair with attitude, you know it’s not enough to do it with a simple normal towel. Instead, invest in a quality microfiber towel that will such in all the extra water and keep your hair from turning into the biggest hairy mess. Don’t just rub your hair with a towel but press and twist the extra water using a microfiber towel instead. If you have a thick, wavy or curly hair, you already know it’s impossible to brush it, even when it’s dry. So, the best way to prevent your hair from getting ripped off your skull is to use your fingers instead. A brush will only disturb the hair even more and destroy the given structure. This is why I recommend fingertips to keep your waves and curls in place. You can also use a large tooth comb to untangle it and give it a natural finish. It will help you untangle your hair and get it ready for further styling. To make it easier, you can apply a conditioner for dry hair that will make your hair wetter and lighter. When it comes to hair products for thick hair, less is more. Feel free to apply a little bit more in humid weather, but don’t exaggerate on normal days. Using too many hair styling products to tame thick hair is one of the most common mistakes people make. Every time you’re tempted to use more hair products, remember that your hair is made to move, not to stay in one place like Bree’s hair from Desperate Housewives (stunning yet creepy). You should rather invest in a few extra quality hair products that will keep your hair in place without much application and give it the proper structure you want. Most shampoos take away the natural shine and oils from your hair, especially if you wash your hair on a daily basis. And because dried out stands will only make your hair a complete mess, you should change your shampoo for a cleansing conditioner and invest in a quality one. Choose a conditioner with a high level of glycerin and panthenol because it will give your hair that natural shine we only see at commercials. You can also pick the one containing essential oils and aloe vera to maintain your cuticle from the inside out. Once you apply this change in your washing, you will notice an incredible change in the drying and styling of your thick hair. It will immediately gain that silky shiny touch. I’ve mentioned before, and I will mention it again because it’s one of the biggest mistakes I’ve done with my hair and it resulted in a mess. Whatever you do, don’t style your hair while it’s still wet. Leave it to dry or dry it with some of the best dryers I’ve mentioned at the beginning of this article and start styling when it’s around 85% dry. If you ignore this tip, you will definitely ruin the shape of your hair like I did and turn it into a complete mess, especially if you’re dealing with a thick heavy hair like mine. Having a hair like this is enough challenge, so don’t make it worse for yourself and follow professional advice. I’m not saying I’m the professional but I’ve professionally done my research on this. Plus, I’m speaking from my own experience and I wanted to warn you about it. I’m interested in hearing which one of the hair dryers I presented you plan to try. I also want to hear about funny experiences you’ve had with your thick hair and what tips and tricks you would give other people who face the same challenge.